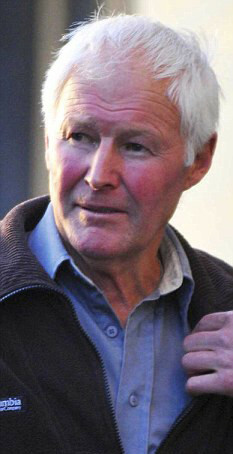 Francis Dunn killed his neighbours pedigree cat. A pensioner who set a rat trap as a favour for a woman with a rodent problem has been found guilty of snaring and killing another neighbour’s pedigree cat. Francis Dunn, 75, had laid the ‘Fenn’ trap in his neighbour’s garden in a bid to solve a rat problem. The rusty trap was designed to snap the spine of a rodent, but the seven-year-old British blue pedigree cat was slowly strangled after getting his neck caught. Distraught neighbour Hilary Star discovered the cat who belonged to fellow neighbour Mike Maber. Mr Maber who named his pet Blue, learned his cat died a ‘painful and extremely distressing’ death after being lured into the spring-loaded trap by a bait of bread and corned beef. The retired communications officer with Dorset police was ‘heartbroken’ by the death of the cat whom he had owned since he was a kitten. He only discovered what had happened after returning home to find a note stuck through his door. Mr Dunn, of Weymouth, Dorset, was ‘horrified’ and is no longer on talking terms with Mr Maber or Mrs Star. He was prosecuted by the RSPCA for causing unnecessary suffering to an animal, which he admitted. A court heard the trap should have been set in a box or artificial tunnel so it was only big enough for rodents to access. 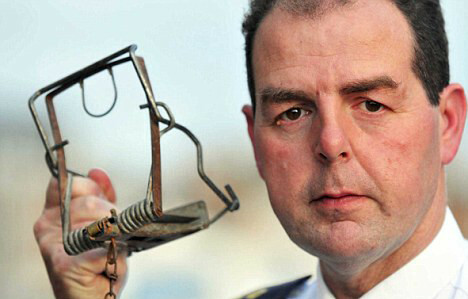 Matthew Knight, prosecuting for the RSPCA, said Dunn had the commercially available trap in his shed and it was legal to use if instructions were followed. Vet James Thorpe who examined Blue said that death was not instantaneous and it would have taken ‘several minutes, if not longer’ for the cat to die. Kenny Sharpe, mitigating, said retired bricklayer Mr Dunn had surrounded the trap with bricks, which he thought would provide sufficient cover. He said: ‘Maybe he should have done more, but at the time he thought he had done enough. ‘He is horrified by what has happened. He didn’t want to cause any distress to any animal. Mr Dunn got a 12 month conditional discharge and was told by magistrates in Weymouth to pay £300 in costs. Mr Maber, 68, said afterwards that he now intends to sue his neighbour for the loss of his beloved Blue. He said: ‘I’m still heartbroken. I live on my own and Blue had been my companion. He said: ‘I had been in London for the day visiting my new granddaughter and when I got back another neighbour had put a note through my door. ‘It said what had happened and that someone had taken Blue to the vet. I had assumed that death was instantaneous but at court the vet said that wasn’t the case. ‘I bought Blue as a kitten for £220 and I am making a civil claim against Mr Dunn for that amount – although I think a new cat would cost over £300.